As I work on the carnation needle book, I’ve run into an issue. I mentioned before that the outer lines wobbled more than I intended them to. As I stem stitched over the outline, following the thread rather than my drifting lines, the full extent of the problem became glaringly obvious. That’s a lot of drift. However, rather than taking the fabric off the frame and consigning it to the trash in despair, I decided to think of this as a design opportunity. 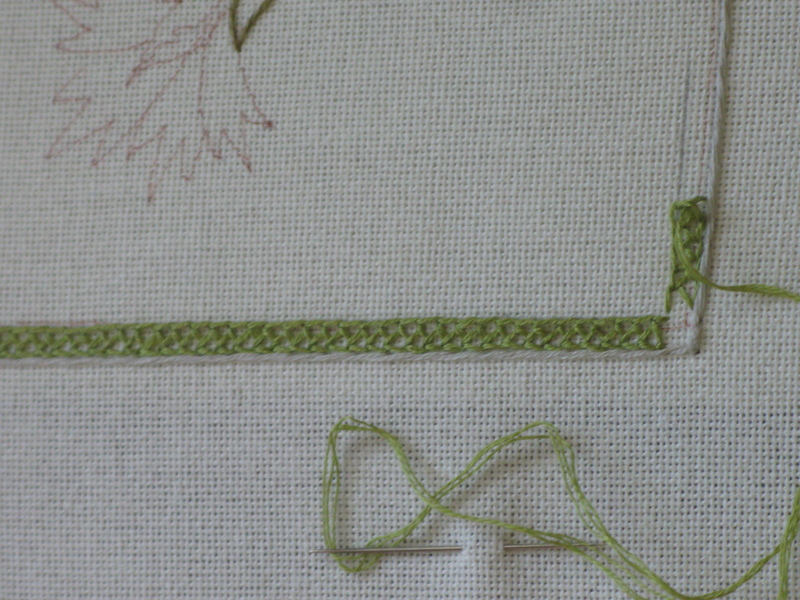 My initial thought for the border was gray stem stitch whipped in green. 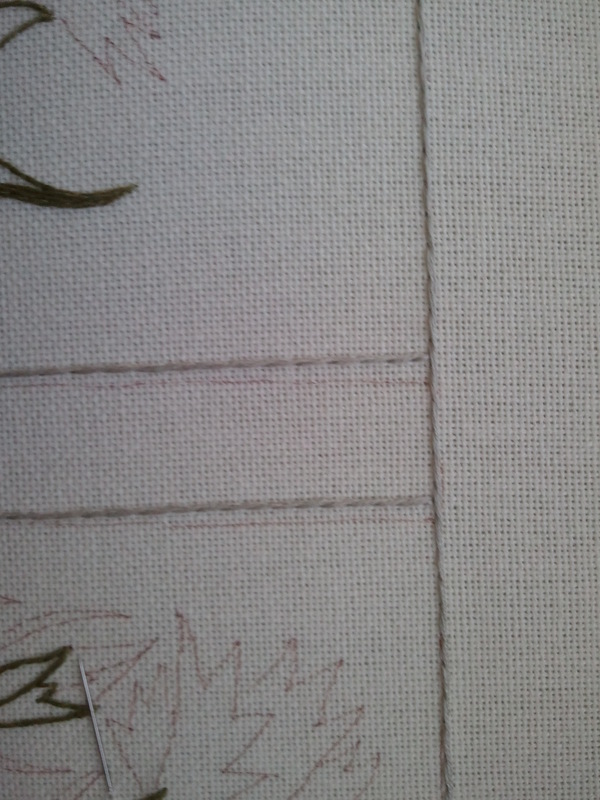 However, given the drifting lines, why not make the border wider? This is double chain stitch, which has an attractive braided look, and, like an ideal tank top, provides enough coverage that you don’t get any unwanted glimpses of the foundation. 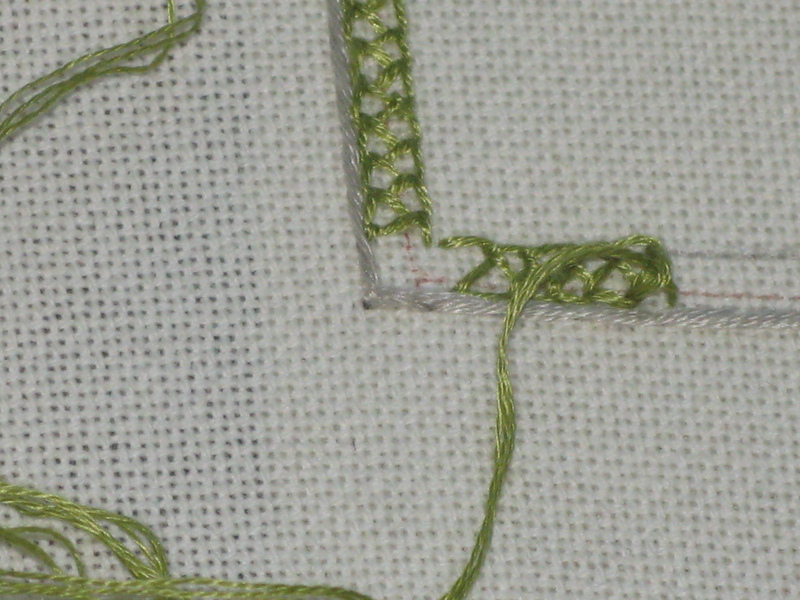 I also considered braid stitch, which is a beautiful stitch, but seems fragile. When I ran my finger over my test stitching, parts of it came loose. (It’s also a possibility that I messed up some essential part of the process, resulting in a fragile braid.) I want borders stable enough that I can toss the finished book in my bag and not worry that the stitches will come loose. I’m going to put another line of stem stitch on the other side, once I’ve feather stitched my way around the back and front covers, and the spine. On the back cover, I left plenty of negative space around the central carnation, so I thought I might continue to alternate bands of border stitches and stem stitch. I think the corners here are going to get a variation of needlepoint block, but I’m not going to decide until I finish the double chain border. Another design opportunity! This entry was posted in Uncategorized and tagged carnation needlebook, chain stitch, embroidery, flowers, needlebook, surface embroidery by Rene. Bookmark the permalink. Thank you! I use my favorite stitches so often, this seemed like a good, line-covering chance to branch out. I think this stitch is a really good compromise, and better than braid stitch. Much better than binning what you’ve stitched so far and starting again, anyway! That would be far too depressing. Maybe it was ‘meant to be’…..